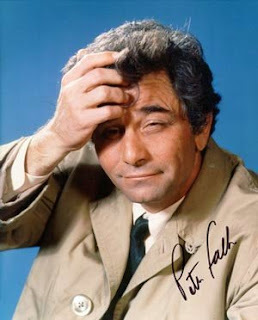 Although novelist Mark Billingham, in his fine tribute to the TV series Columbo, mentioned this last week, I think it’s necessary to mark the occasion on the exact date: Today is the 80th birthday of actor Peter Falk, who of course played the single-monikered Los Angeles homicide investigator in that renowned NBC show. After graduating from Ossining High School, where he was a star athlete and president of his class, Falk served as a cook in the Merchant Marine, then studied at Hamilton College in Clinton, New York, where he completed his work for a B.A. degree in political science at the New School for Social Research in 1951. He earned a Masters degree in public administration at Syracuse University in 1953. After applying unsuccessfully for a job with the Central Intelligence Agency, he became a management analyst with the Connecticut State Budget Bureau, in Hartford. In his spare time he acted with the Mark Twain Maskers in Hartford and studied at the White Barn Theatre in Westport, and for the first time began to consider the possibility of becoming a professional actor. In 1956 at the age of 29 he left his job with the Budget Bureau, moved to Greenwich Village in New York, and declared himself an actor. Falk’s initial television series was The Trials of O’Brien (1965-1966), a “weekly one-hour comedy whodunit” in which he played a well-meaning lawyer who was willing to bend the rules of law a bit in order to make sure that his clients got a “fair go.” (The American Bar Association, accustomed to the more earnest legal proceedings on Perry Mason, apparently complained about O’Brien.) But it was Columbo, which debuted in 1971 as one of three series rotating under the umbrella title, The NBC Mystery Movie (later The NBC Sunday Mystery Movie), that made Falk a familiar face in U.S homes. As most people likely know by now, Falk wasn’t originally envisioned by series creators Richard Levinson and William Link as the right guy to play their persistent L.A. homicide detective. Since Thomas Mitchell, a thespian then in his 70s (and probably best remembered now for playing Scarlett O’Hara’s father in the 1939 film Gone with the Wind), had previously filled the part of Lieutenant Columbo in their theatrical production, Prescription: Murder, Levinson and Link were looking for an older actor when they tried to transfer the character to television. Their preference: Bing Crosby. But after the singer-performer turned them down (reportedly, because their schedule conflicted with his golfing), Levinson and Link instead rethought their protagonist in the form of Falk, whose “rumpled looks and good nature” had impressed them, according to Richard Meyers’ book TV Detectives. After he had played Columbo in two teleflicks, Prescription: Murder (a 1968 adaptation of Levinson and Link’s play) and Ransom for a Dead Man (1971), NBC signed Falk to play the part in a regular, 90-minute series. Columbo ran on NBC from 1971 to 1978 (climbing into the top five of the Nielsen ratings), and then was brought back by competitor ABC in a succession of TV movies broadcast from 1989 to 2003. (A full listing of episodes and teleflicks can be found here.) Falk picked up five Emmy Awards and a Golden Globe for his portrayal of the permanently rumpled and warm-hearted sleuth. Actors could be known for far less memorable roles. Columbo’s genesis dated from March 1960, when Alfred Hitchcock’s Mystery Magazine published a short story, written by two old friends, W. Link and R. Levinson. First entitled “May I Come In?” by the writers, it was then [retitled] “Dear Corpus Delecti.” The policeman, called Lieutenant Fisher, was a little man, who looked insignificant. Columbo was taking shape. “We recalled the policeman [Porfiry] Petrovitch in Dotstoïevski’s Crime and Punishment. This character, even if he looked quite humble, was in fact really intimidating. He knew how to catch the killers off guard,” explained William Link. Also interesting, from the same site, is an article titled “How We Created Columbo--and How He Nearly Killed Us,” by Levinson and Link, which is an excerpt from their 1981 book, Stay Tuned: An Inside Look at the Making of Prime Time Television. READ MORE: “Lt. Columbo: The Genesis of a Character,” by Steve Lewis (Mystery*File). I was interested to learn that Columbo had its origins in a play. Was it ever performed on stage? And does this link the show to the vanished era of crime/mystery plays? My understanding is that the character of Columbo first appeared on television, on the Chevy Mystery Show, after which creators Richard Levinson and William Link used him in a play (and yes, it did feature on Broadway). From there, Columbo returned to become famous on TV again, as the protagonist in one of the original NBC Mystery Movie series.